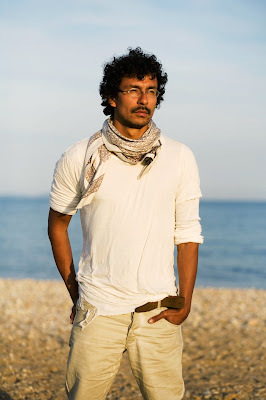 I think its about time we have a thread to discuss the work of Haider Ackermann, who happens to be one of my personal favourites in the fashion realm. Haider Ackermann was born in Santa Fe de Bogota, Columbia in 1971. He moved to Belgium in 1994 to study at the fashion department of the Royal Academy of Antwerp. After working as an intern at John Galliano's Paris offices, Ackermann became the assistant to his former academy teacher Wim Neels and worked on the Belgian designers men's and womenswear collections. Following strong industry encouragement, Ackermann presented his first, self-financed women's collection in Paris for Autumn-Winter 2002. Ackermann was hired as the head designer for Ruffo Research, commissioned to design two collections (Spring-Summer and Autumn-Winter 2003), while continuing to produce his own line. The excerpt is quite old and taken from Showstudio.com. From what I have gathered in interviews, Haider has had quite a nomadic life and his travel and experiences have a lot to do with his sense of aesthetics. One of the more encouraging figures in the early half of his career was none other than Raf Simons, who supposedly reffered him to industry affiliates(Ruffo research?) as he was impressed with Haiders talent. Haiders business is under the wing of Madame Ann Chappelle, of BVBA 32, who also produces/manages Ann Demeulemeester. Haider seems to floor me season after season by his ability to find almost perfect balance between structured and fluid elements that are evident in his sharp-padded leather blousons artfully draped at the waist, worn over his beautifully convoluted jersey dresses and finished with butter soft stretch leather/suede leggings and towering wedge-heel hybrids. Nomadic warrior-godesses who seem to fade into their surroundings in their palette of midnights,smokes,leaf,desert browns,and murky purples. Although some of the head to toe looks might be a bit too severe/austere for some women, I think he offers some beautiful seperates that would integrate beautifully into a wardrobe of Rick, Ann and other contemporary 'avant-garde' labels. Definitely one place where I would really really like to intern. If anyone has more info please contribute. whereas the earlier stuff is so raw, both materially and in terms of ideas. i like seeing where he came from though, it makes his present work more accessible and appealing, imo. i believe sarah rutson (fashion director of lane crawford) wears a fair amount of ackermann... if not i think she should. The man is awesome. Hopefully he will do menswear one day, although looking at the womens is good enough! currently my favorite Belgian line. love my leather leggings to death. ahah yes the girl of possible worlds is always wearing his designs. haider ackermann is soooo good! looking at these older collections you can really see his growth over the years. i havent seen that ss 04 collection before - wow - thanks for posting. i think the most recent fw 09 collection is really great, too. yeah - i wish he did men's aswell but, as snafu said, it looks like there are a few pieces that can be pulled off by a man without being overly femme-y. Last edited by rorschach; 03-19-2009 at 02:05 PM. ^I listed the stockists in the stockist thread. Please keep where2kop questions out of the designer threads.